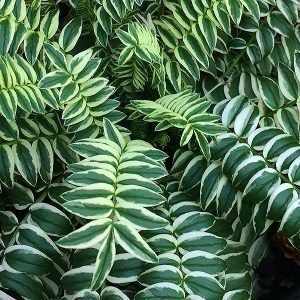 With strong variegation, Polemonium caeruleum ‘Brise d’Anjou’ with its deep green and cream foliage is a great plant for adding a little colour to a shaded position. As it emerges from dormancy in spring, the flowers rise well above the foliage, a blue to mauve in colour. In full flower the plant will reach around 60 cm in height. It does like a humus rich soil, moist yet with good drainage. Usful in in any shaded position in a humus rich soil. This is a relatively low growing plant, so plant it near the front of the shade border for best results. After flowering is a good time to prune Polemonium ‘Brise d’Anjou’ to tidy up and promote new growth and perhaps a second flush of flowers. Do this by pruning right back to the base. If you can maintain moisture through summer the foliage will remain vibrant. You can grow Polemonium caeruleum ‘Brise d’Anjou’ in a container, use a high quality potting mix with added water retention material. Fertilise with a general purpose slow release fertiliser in spring and occasional liquid feed with a seaweed fertiliser through the growing season.